Batman has quite a few birthdays this year. On April 25th his first solo series took flight, while the cover date for his first appearance, Detective Comics #27, is May 1939. 10:47pm on June 26th has consistently been the date Batman's parents were killed, while DC marks July 23 as the official Batman Day (which as marketing would have it ties in with San Diego Comic Con). Finally, in-print Bruce Wayne's birthday has changed from April 7, to February 19, to October in The Batman animated series, to November according to iconic Bat-writer Frank Miller. Point is today is one of the most likely days in the year you can light a cake for Bats, and so I'm using it to spotlight one of the best done-in-one Batman comics ever (remember those), The Joker's Five Way Revenge by artist and Bat-icon Neal Adams and still unbeaten Batman writer, Denny O'Neil. Look at that logo wouldja? I tell you if that thing ever came back to Batman comics it would be a step in the right direction. This story isn't just one of the best D.I.O's in Batman history, it is one of the best in the entire history of comics. Bold claim, but with an all-star creative team and iconic moments for both Batman and The Joker that still endure to this day, how can it not be? When I first read this tale, it was in a Batman Annual from the UK. Years later, upon getting a copy of the American issue, I realised the Annual had left out the last two panels of the story, as well as one whole page where one of the Joker's targets runs through the docks. Even now I still prefer the 'edited' version, but either way, it's a classic. 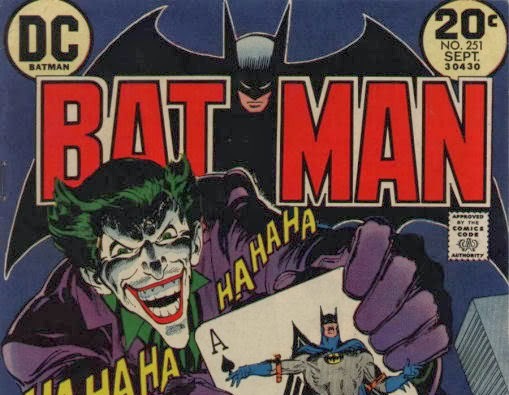 The main point of this issue was to further re-establish The Joker as a credible threat, after a period of goofiness, aided by the Adam West Batman TV show. From the opening splash page of his wicked grin laughing in the rain, you can consider that mission accomplished. You did click to enlarge that right? Don't let anyone tell you otherwise, the best Batman stories are the ones where the Dark Knight not only earns the mantle of 'Detective', but where you as the reader, get to piece the clues together along with him. Denny is the undisputed master of this aspect. That image of Joker standing on Batman's throat has haunted me since I was a kid. Easily one of the key moments in visually upping The Joker's credibility, I just couldn't understand why if Batman truly was the thorn in his side, and Jokes was evil enough to kill his old friends, why he didn't just stomp down there and then. Now I understand it highlights his insanity and sense of honour, but back then it birthed 'WTF' long before 'WTF' was famous. 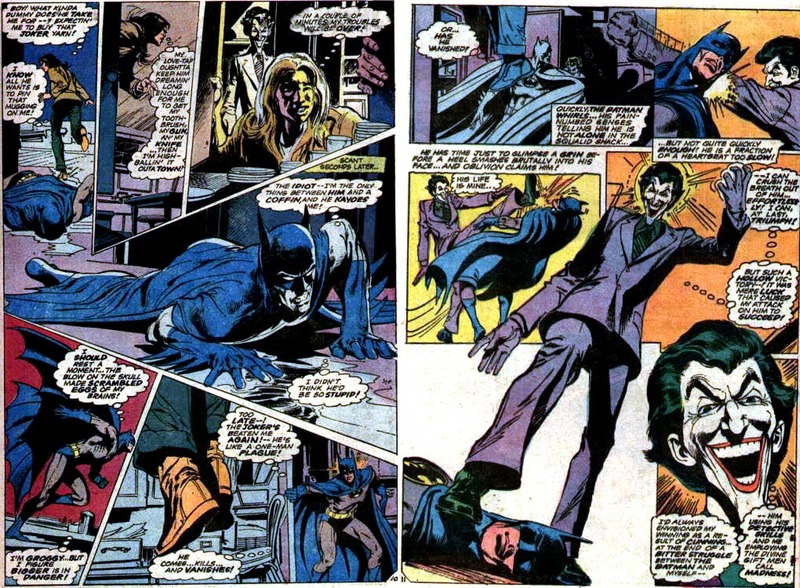 Following a few pages more of the 'side-by-side with the reader' detective work I was talking about earlier, Batman realises the Joker has taken his latest victim, the wheelchair bound Hooley, to an abandoned marine center. Right from his arrival, Denny wastes no time in further structuring Joker's rise in evilness, consistently relating him to a shark - a predator of the highest order - like in the panel at the top of this post. While I will stop with the spoiling of the story there, so any people who haven't yet read such a comic staple of cool can still be surprised by the outcome, this post would have a huge injustice done to it, if it didn't include the unbeaten bat-splash page that occurs within the issue. Infact it's a pretty good note to go out on. 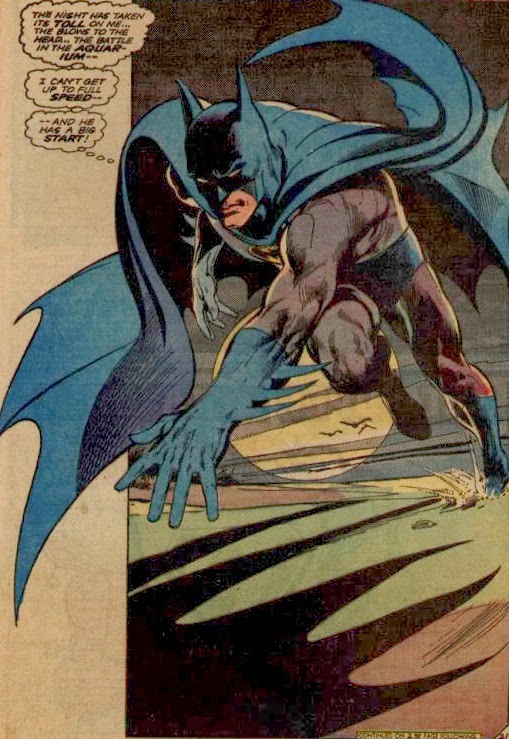 Happy 75th Batman - may your cape and cool float like a Neal Adams splashie for 75 years more.